The lost city of Teyuna (better known as Ciudad Perdida) sits high in the mountains of Colombia's northern jungle and there's only one way to reach it... This two-week trekking holiday in Colombia takes you on a trek right through the rainforest to this deserted and enigmatic lost city. Of course, the trek won't take the whole two weeks, and we've also included some time in the stunning colonial city of Cartagena, before heading to the beachside town of Santa Marta, which will be the base for our trek to Ciudad Perdida. If you'd prefer something more organised, why not take a boat trip out to the beautiful beaches of the Rosario Islands? If you'd like some extended relaxation, why not extend the Colombia part of your holiday with a few days in the stunning Tayrona National Park? We’ve kept this morning free to give you chance for a leisurely breakfast and some time to introduce yourself to the city. This afternoon, we’ll pick you up and take you on a guided tour of our favourite sites in Cusco, including the most famous ruin of Sacsayhuaman. Your tour will be on foot to allow your guide to help you get your bearings and point out the more interesting quirky Inca features you pass by which you don’t get to see from the window of a coach. 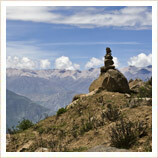 Or we could take you out of Cusco to visit the Inca sites in the beautiful Sacred Valley of the Urubamba? 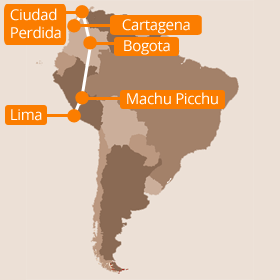 Why not hire an extra porter so you can trek the Inca Trail completely unencumbered? We will enjoy one of the best-preserved sections of the Inca Trail this morning, as we climb an Inca stairway up past the small Inca village of Runkuracay on our way to the second high pass of the trek. At just under 4000m, this is a little easier than yesterday’s climb, and gives us the chance for some wonderful views of the Pumasillo mountains. From the pass, we descend into the cloud forest to the labyrinthine ruins of Sayacmarca (aptly meaning Inaccessible Town). From here the Inca Trail broadens and passes through the steep upper fringes of the cloud forest through a colourful riot of orchids, bromeliads, mosses and ferns. The air is perceptibly thicker and the atmosphere warmer and more humid, even as we approach the trek’s third pass, at 3,670m, where Inca viewing platforms overlook the archaeological complex of Phuyupatamarca (Cloud-level Town). If you’d like a bit of luxury after your trek, why not ask us about upgrading to the gorgeous Pueblo hotel, with its stunning gardens and private hot springs? If archaeology and history are your thing, then a few days investigating the prehistoric stone idols and rock tombs of San Agustin and Tierradentro are a must. Deep in the south of Colombia, they offer a fascinating counterpoint to the northern lost city of Teyuna,and are a must for anyone interested in this side of Colombian culture. If you’re keen to get your blood pumping before your Inca Trail trek, how about a bit of rafting action? There is a good choice of rivers with excellent white-water rafting opportunities near Cusco and we can organise a full day’s rafting for you or even a couple of days with camping overnight to go that extra mile. Our standard price for this trekking holiday in Colombia and Peru is £2895 per person, which is based on two sharing a double or twin room in our standard hotels. That price includes all your accommodation, internal transport, transfers, tours, guides, equipment and entrance fees, plus all meals on the treks and breakfast every day.